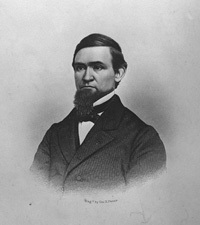 COLE, Cornelius, a Representative and a Senator from California; born in Lodi, Seneca County, N.Y., September 17, 1822; attended the common schools, Ovid Academy at Ovid, Lima Seminary at Lima, and Hobart College at Geneva, N.Y.; graduated from Wesleyan University, Middletown, Conn., in 1847; studied law; admitted to the bar in Auburn, N.Y., in 1848; went to California in 1849, and after working a year in the gold mines commenced the practice of law in San Francisco in 1850; moved to Sacramento in 1851; district attorney of Sacramento City and County 1859-1862; member of the Republican National Committee 1856-1860; moved to Santa Cruz in 1862; during the Civil War was commissioned as a captain in the Union Army in 1863; elected as a Union Republican to the Thirty-eighth Congress (March 4, 1863-March 3, 1865); elected as a Republican to the United States Senate and served from March 4, 1867, to March 3, 1873; chairman, Committee on Appropriations (Forty-second Congress); resumed the practice of law; moved to Colegrove, Los Angeles County, Calif., in 1880, and retired from active practice; died in Hollywood, Calif., November 3, 1924; interment in Hollywood Cemetery. Cole, Cornelius. Memoirs of Cornelius Cole. New York: McLaughlin Brothers, 1908; Cole, Cornelius, II. Senator Cornelius Cole and the Beginning of Hollywood. Los Angeles: Crescent Publications, 1980.